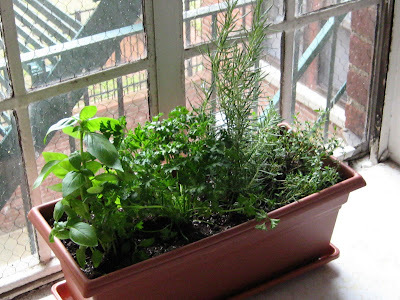 We went to the farmer's market in Union Square on Saturday and finally picked up some herbs for me to try and tend. I've never really tried to grow anything, or really had the responsibility of caring for a life form other than myself(which, truth be told, I'm probably only barely receiving passing marks for)... thus my little baby herbs become an awesome responsibility. I should note that the herbs didn't come in that pretty pot... I had to put them there, and even add soil. Pretty impressive, eh? Well, OK, Anna told me what to do and all, but still. For people as plant illiterate as myself, from left to right, it's: basil, curly parsley, rosemary, and thyme. Pretty much the big 'uns. We left a space for cilantro, because I use a ton of that, but the locals said to wait until next week when the plants are bigger. If I show that I can take care of these guys, I think Anna might let me get another pot to put some the lesser used herbs like sage and chervil and marjoram. (ohpleasepleaseplease) I had presumed our window, which gets only obstructed morning sun was insufficient for growing herbs, but Anna says otherwise. I admit that I am shamelessly excited. I spend a ton of money buying those "fresh herb packs" and waste a lot of it, not being able to use the entire package before it goes bad. I mean, I buy a couple ounces of sage, because that's how it comes, and then I make a sage-vermouth sauce for some pan roasted chicken breasts... which is super yummy, of course... but then what? Wasted sage is what. So I tend not to buy those crazy herbs unless I've got real plans for them... but if I had them growing right there... wouldn't some chervil be yummy on a salad? I bet it would... and if I could just cut off a few leaves of a plant I bet I would do it all the time. Each of the herb plants I bought cost me $3.50(3 for $10 was the deal), which I doubt is too much more expensive than one of those little plastic containers I buy from the supermarket. It probably cost about $15 for the pot, sub-pot thingie, and little bag of soil to make my mini-garden. I presume if I have any semblance of a green thumb, that I'm going to save a fair amount of money in my cooking... while at the same time making it fresher and more interesting.